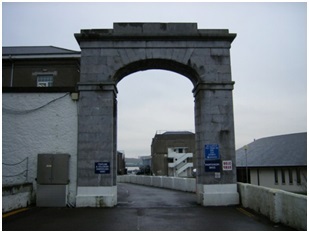 The fine buildings of the Haulbowline Naval Base were constructed by the British in 1806. The adjacent basin and dock, the Royal Alexandra Yard, were opened in 1822. 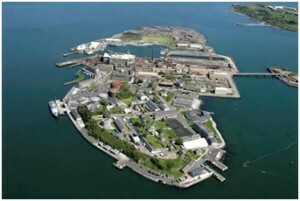 In 1806 when the British Army moved to Spike Island, Haulbowline was handed over to the Royal Navy. The Navy established a large arsenal on the island and a Martello tower and naval dockyard were built during the Napoleonic Wars. In 1869 a major industrial dockyard for the repair and maintenance of naval ships was established on the island. When the dockyard was being built, a further 30 acres of ground were reclaimed, bringing the total area of the island to about 60 acres. The dockyard grew in size and expertise until it employed 3,000 at its peak during WWI. 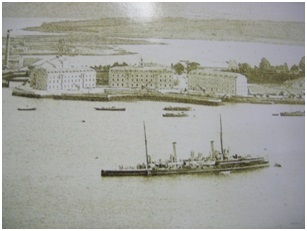 The dockyard was handed over to the Irish government in 1923. Click here for more info. One of the more notable Royal Navy’s Cork sons, and one of significant historical importance, was Ballinacurra born, Edward Bransfield. It was he who first charted the then newly discovered Antarctic. His family were, and are still to this day; mainly found in, and around the Middleton area. Click here for more info. North-South direction to divide the island, with an archway for access. The wall and archway still stand. The Board of Ordnance was responsible for supplying the Fleet with guns, ammunition and gun powder. 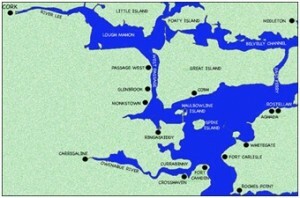 They occupied the West side of the island from 1806 to 1915. Among the personnel who served with the Board of Ordnance at Haulbowline with the King’s Regiment in 1882 was a young James Connolly, executed 34 years later for his part in the Easter Rising. 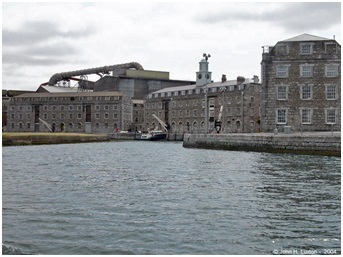 Haulbowline was a very important re-supply base during WW1 for the allied forces. Admiral Sir Lewis Bayly commanded in Queenstown from 1915 to 1919; his area of responsibility extended from North of Scotland to France. In 1917 the strength of the Naval Fleet in Cork Harbour was greatly increased with the arrival of US Navy warships as America had entered the War after the sinking of the Lusitania. The Treaty of 1921 gave Ireland independence from Great Britain. Haulbowline was transferred to the Irish Free State on 31st Mar 1923, the Naval Base was closed down but kept on a “care and maintenance” basis by the Office of Public Works throughout the 1930s as Ireland did not have a navy. 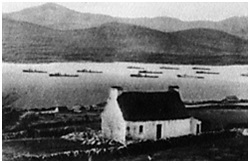 Great Britain kept possession of the three Treaty Ports of Berehaven, Cork and Lough Swilly throughout the 1920’s and up until 1938. Cobh was a small fishing village until the early 1800s when the town became a British Naval Port. The British built fine buildings in the port, many of which still stand today. After a visit by Queen Victoria in 1849 the town’s name was changed from Cobh to Queenstown. The town’s name reverted to Cobh in 1922 when it was handed over to the Irish Free State. Cobh was the last port of call for Titanic in April 1912. On 07 May 1915 the Lusitania was sunk off Kinsale. A memorial to the drowned, many of whom were brought ashore at Queenstown, stands at the quayside. 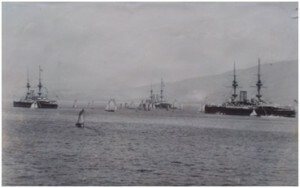 During WW1 the port was primarily used by the US Navy as a base for convoy protection and anti-submarine operations. To protect vessels moored in the bay, at Haulbowline and at Queenstown (Cobh), a boom and anti-submarine net were established to the east of Spike Island during WW1. More information on these loops can be found by clicking here. Lough Swilly is a quiet deep-water fjord in County Donegal. Between 1798 and 1800 forts were built at opposite sides of the channel being Dunree, Ard’s Point, Salpan Hill and Inch Island to the East and Macamish Point and Knockalla to the West. Knockalla and Dunree were the main forts being closest to the mouth of the Lough and at its narrowest point. 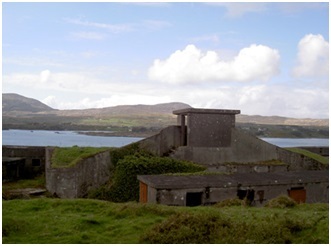 By the beginning of WW1 in 1914 massive fortifications with gun emplacements had been built at both Lenan and Dunree. In October 1914 it became home to the British Grand Fleet. The fleet’s commander, Admiral Viscount Jellicoe, feared a German submarine attack on its base at Scapa Flow in the Orkney Islands. He ordered his vessels to move to Lough Swilly whilst the submarine obstructions at Scapa were being perfected. People living along the lough shore witnessed the arrival of some 40 destroyers, cruisers and repair ships. Fresh water was piped from the hills and supplies were bought in from local towns and villages. Admiral Jellicoe divided his time between Buncrana on the eastern shore and Rathmullen across the water. In Rathmullan, four kite balloons were deployed from the Royal Naval Air Service station, now a football pitch in the village. The balloons, which carried a serviceman suspended below, were used to spot enemy submarines. Admiral Jellicoe himself stayed in the Pier Hotel. It was also the family home of James Deeney, who still has the hotel register dating back to 1914. A little further north, from their base at Fort Dunree on the lough’s eastern shore, hundreds of soldiers kept watch at the mouth of the Swilly. The artillery guns there and at Leenan Fort reached into the North Atlantic. Today, the Inishowen Friends of Messines commemorate all those who went off to WW1 and didn’t return. A memorial wall at Fort Dunree, on the banks of Lough Swilly, is dedicated to those from the area who died in the conflict. Lough Swilly contains a number of shipwreck sites with fifty eight being recorded in the Duchas shipwreck database in the Lough. There are many wrecks from WW1 and WW2 but the most famous is the wreck of the Laurentic which was carrying gold amongst its cargo. Dún Laoghaire (Dunleary) was a small town until the British marked it as a potential new port close to Dublin. Construction was authorised in 1816 and when King George IV came to visit the new port under construction in 1821, the name Dunleary was dropped in favour of the name Kingstown. The town reverted to the name Dunleary in 1920 when the port was handed back to the Irish Free State. 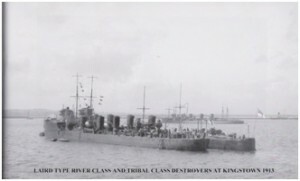 Kingstown was a base for armed patrol trawlers between 1915 and 1919. The shore establishment at Kingstown was called HMS Boadicia II. Over fifty trawlers were based at Kingstown during WW1 performing minesweeping and anti-submarine operations in the Irish Sea but many warships visited the port throughout WW1. HMS Result is typical of the type of trawler that patrolled the Irish Sea. Berehaven Harbour is located in Bantry Bay, West Cork and was chosen as a base by the British due to its deep sheltered waters and its ready access to the Atlantic Ocean. Land was purchased by compulsory order in 1898 to erect suitable defences to protect the Royal Navy Dreadnoughts which would soon be based there. Many of the gun batteries remain to this day. Click here for further information and photos. To protect vessels moored in the harbour a submarine detector loop was erected. More information on these loops can be found by clicking here.